Is it me or are pineapples everywhere at the moment? 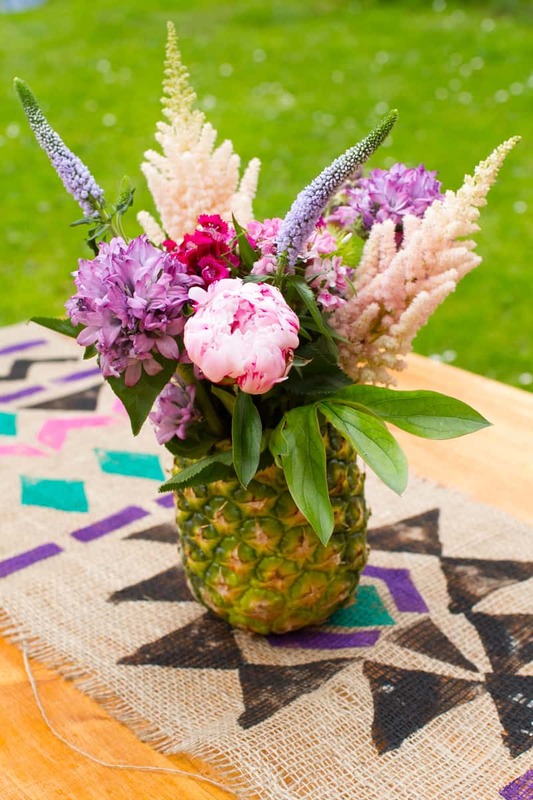 This zingy tropical fruit has really taken the fashion world by storm popping up everywhere from cushions and clutches to dresses and decor, so to pay homage to the humble pineapple I decided to use the real thing to create this fabulous fruity floral arrangement. It really was so easy to make and super cheap, you have to give this one a try this summer! Step 2: Using the knife cut a hole in the flesh of the pineapple about half an inch from the edge as this will help make the pineapple more sturdy and keep its balance. Step 3: Using a spoon or Ice cream scoop, remove the flesh of the fruit. Step 4: Cut a plastic bottle so that it fits snug in the pineapple. Step 5: Fill the bottle with water. Step 6: Cut your flowers down to size and arrange in your pineapple. And there you have it the most adorable tropical centrepiece, say goodbye to vases and mason Jars the pineapple is the new flower vessel. I would love to see yours, remember to hashtag #BespokeBride on Instagram and if you like our DIYs you can show your support by voting for us here & here, we would really appreciate it! Hello! I was wondering if you could tell me what the names are of the two taller flowers in the arrangement? The thin purple one with green on the tip and the fluffy light pink one. Thanks! So cute and creative! This would make a great centerpiece for any summer party! Once the pineapple is cut, how long should it last? Is it possible to use a pineapple coring device? Are green, not ripe, pineapples best to use? Spray paint….will that change the consistency of the inside flesh? Don’t know whether to spray paint the pineapple or leave them natural. (I know not to eat a painted pineapple.) Thank you for answering my curiosities! Once the pineapple is cut I would only expect it to last a day or two and I suspect using a pineapple corer would be a much easier way of removing the flesh. Green pinapples may last a little longer than ripe and spray paint doesn’t change the consistency of the flesh but we did find our pineapples started to decay after about 3 days once painted. I want to us this ideas for an outside event but I know the pineapples will attract bugs. Do you have any suggestions on how to keep the flys away? Sounds great! You could consider lighting some anti-bug candles near the pineapples? Are those real or fake flowers? Where did you get them? They are indeed real flowers, from our local florist. How long would the whole pinneaple last before I prepared arrangement after purchasing from store? I’m really not sure but I would guess a week or so? We really didn’t notice a smell tbh, might be different in a warm room thought?